Play and compose guitar music with ease! MagicScore Guitar 8 offers everything you need as a guitar player. Whether you are seasoned professional, music teacher or just a learning beginner, MagicScore Guitar will bring the full power of a highly sophisticated tab editing and music notation software right to your fingertips. This powerful and user-friendly solution allows you to quickly compose songs by laying them out along with tabs and notes. You can use it for creating arrangements or for advancing to the next level of your performance skills. There are built-in features for helping you share your tabs and notes, training tools allowing you to practice a song, as well as teaching tools to help newbies learn how to play the guitar. MagicScore Guitar is extremely versatile and easy to use, providing the full range of features that amateur and professional guitar players alike can put to good use. Writing music and laying out arrangements with MagicScore Guitar could not be made easier. 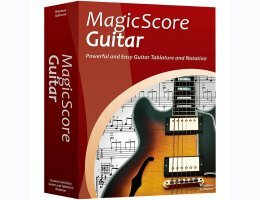 When compared to similar products, MagicScore Guitar often comes out on top in terms of quality of tabs and notes, performance and ease of use, delivering the required flexibility, depth and sheer quality. You can create tabs and notes in no time by using automatic synchronization. You can also insert guitar frames into your compositions, edit and print tabs along with high quality notes. Once you complete your composition, you can print the entire composition and instrumental parts. Also you can use the many sharing and collaboration features available to share your music with others via social networks or email. You can even use a free built-in plugin, Maestro Online, to post live tabs and notes directly onto a Web page of your own. MagicScore Guitar enables producing music that sounds exactly the way you want it. The tool includes a Piano Roll editor, Velocity Editor, Tempo Editor, and MIDI Events Editor, and the ability to embed audio track. You can easily import notes and tabs from gp4, MusicXML, MIDI and KAR formats, and then edit your work using features that are only available with MagicScore Guitar. The audio track embedding allows importing and embedding audio from an MP3 and WAV files. MagicScore Guitar natively saves the results into a proprietary SFD format. The SFD format is cross-compatible between all Maestro products, allowing you to publish live tabs and notes with Maestro Online, or use the powerful editing features of Maestro Composer. In addition, you can export your music into a wide range of popular formats such as PDF, TIFF, JPG, PNG, GIF, WMF, EMF for easy high-quality printing. Playable music can be saved into MP3, WAV, MIDI, KAR, and MusicXML audio formats. MagicScore Guitar allows you to create tablature and music notations either for a single guitar or for your entire band. And we’re not talking of just the guitar here. You can easily use the same tool to lay out scores for drums, keyboards, strings, winds and many other instruments, enabling you to create more sophisticated compositions with multiple instruments. This makes MagicScore Guitar a truly versatile tool that is ready to suit even the most stringent requirements of bands and musicians. GuitartTab Maestro is equipped with comprehensive interactive help system, which makes it easy to start using the product, teaches effective techniques for common activities, and explains how to use all the advanced features. In addition, the help system contains a number of interactive lessons.